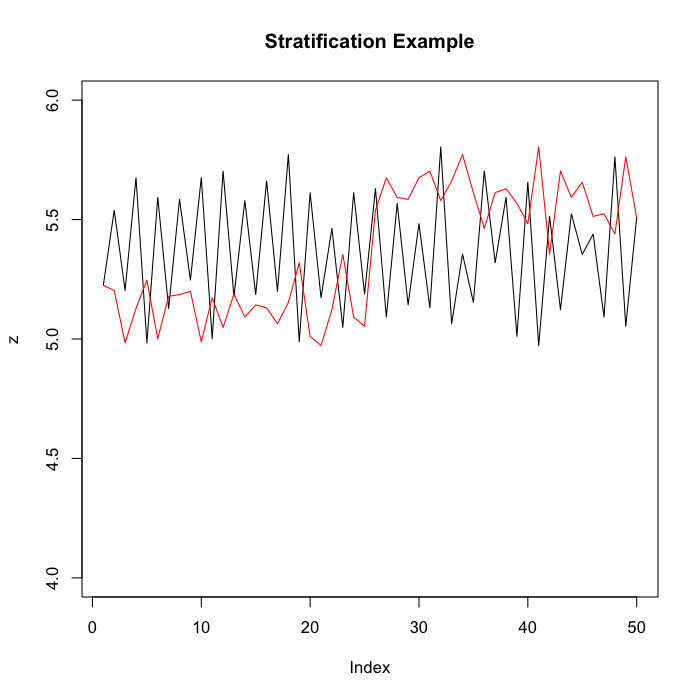 Stratification refers to a technique in which a dataset is separated into two or more separate groups in order to better understand what is occurring. In the example above, the black line shows hypothetical measurements for dimensions of 50 parts. The parts, however were produced on two different machines. The red line shows the effect of first plotting the dimensions of all the parts produced on machine A, followed by the dimensions of all the parts produced on machine B. Similarly, if one has height and weight data for the members of a high school class, one could examine the data with a scatter plot. The result might be confusing however. But if the data were plotted with red dots for female students and blue dots for males, the picture would be more understandable.